CP1300 Mini Photo Printer. We bought this for our wedding. The WiFi went down so it's only been used for 6 prints - all fantastic quality. Venue was non-smoking. Enjoy fast wireless prints from smart devices with Canon PRINT app, MopriaTM, Apple AirPrintTM and Wi-Fi Button. Combine images from multiple smartphones with Party Shuffle. Prints colour, black and white. 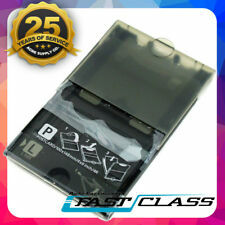 Genuine Canon PCPL-CP400 Postcard Size 4x6" L Paper Cassette Selphy CP1200 CP910 CP900 CP800 CP810 CP1300.  Ink - KC 36IP. This Canon ink and paper set are compatible with the Canon Selphy printer range. Ink & Toner.  Compatible with Canon CP100, CP200 and CP30.  54 x 85 mm Credit Card Size Paper Set.  36 Sheets. Canon Selphy CP720 Printer With Spare Ink Cassettes And Paper. Condition is New. Dispatched with eBay delivery – Shutl 1 day. 2236C010 KP-36IP Canon SELPHY CP1300 Pink Photo Printer inc RP-36IP Ink Paper Set for 36x Photos :: 2236C010 KP-36IP (Printers > Inkjet & Photo Printers) }. Dot Matrix Printers. Images for illustration purposes only. 2234C010 KP-36IP Canon SELPHY CP1300 Black Photo Printer inc RP-36I Ink Paper Set for 36x Photos - 2234C010 KP-36IP (Printers > Inkjet & Photo Printers). Dot Matrix Printers. Images for illustration purposes only. 2234C010 RP-108IN Canon SELPHY CP1300 Black Photo Printer inc RP-108 Ink Paper Set for 108x Photos - 2234C010 RP-108IN (Printers > Inkjet & Photo Printers) }. Dot Matrix Printers. Images for illustration purposes only. 2235C010 RP-108IN Canon SELPHY CP1300 White Photo Printer inc RP-108 Ink Paper Set for 108x Photos - 2235C010 RP-108IN (Printers > Inkjet & Photo Printers). Dot Matrix Printers. Images for illustration purposes only. 2236C010 RP-108IN Canon SELPHY CP1300 Pink Photo Printer inc RP-108 Ink Paper Set for 108x Photos - 2236C010 RP-108IN (Printers > Inkjet & Photo Printers) }. Enjoy superfast lab-quality photo prints from compatible smart devices ???. 2235C010 KP-36IP Canon SELPHY CP1300 White Photo Printer inc KP-36IP Ink Paper Set for 36x Photos - 2235C010 KP-36IP (Printers > Inkjet & Photo Printers). Dot Matrix Printers. Images for illustration purposes only. Accessories: power adapter, usb cable, serial cable m/f, roll test, driver cd. Auto cutter: < span class = notranslate ' > 1,000 . -Applications of type "receipt" (width 80 mm-courtesy printer). Canon Selphy Printer Ds700. Condition: Not working as intended. We aim to make the process as smooth as possible. Accessories: feeder, roll test, driver cd. Rear panel Ethernet communication interface. Auto cutter: < span class = notranslate ' > 1,000 . -Applications of type "receipt" (width 80 mm-courtesy printer). LA SIGLA (PRL): PARMALUCA. 25 SHEETS PRINT PAPER PLUS INK RIBBON. OTROS IDIOMAS. UNE SEULE EXP. VOIRE PHOTOS SVP. LIKE ITALIAN TEXT. VENDUTO CON LA FORMULA "AS IT IS". NOUVEAU AVEC BOITE. You can also print a variety of other sizes including 4" x 8" (wide size), credit card size, and mini label. Fully automatic, you get prints that compare in quality to those from a professional lab. This is a new Canon Selphy CP400 Compact Photo Printer. It was opened but never used. Compact Photo Printer. 5 Sheets of Color Ink / Paper Set (Includes the Color Ink Cassette for 36 printouts). Ho ricevuto in regalo la stampante a inizio 2011, ma non l'ho mai utilizzata. With its convenient handle, it begs you to take it to your next children′s party or family get-together. Print quality was mostly good: Grayscale photos and portraits with various skin tones looked natural. CANON SELPHY CP910 COMPACT PHOTO PRINTER. OEM CANON SELPHY PRINTER PAPER. THE PRINTER IS NEW IN BOX AND IS READY TO USE. COMPACT POWER ADAPTER. What's included in this sale?. (If it's not listed below, it is NOT included!). Xtech Hard-shell Custom Case for Canon Selphy Printers (Black). Canon SELPHY CP1300 Wireless Compact Photo Printer with AirPrint and Mopria Device Printing, Black (2234C001). Enjoy the simplicity of connecting your smartphone and tablet with ease, through the Canon PRINT app3. Brand new. Never been used. Received for Christmas but didn’t need. 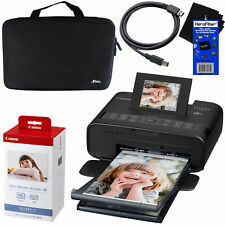 Canon Selphy CP1300 Photo Printer with WiFi and color ink and paper bundle set. Shipped with USPS Priority Mail. PLEASE NOTE: THIS UNIT IS NOT COMPATIBLE WITH WINDOWS 10 OPERATING SYSTEM. THE DRIVER IS COMPATIBLE WITH XP, VISTA & WINDOWS 7. WINDOWS 10 DRIVER NOT AVAILABLE AT THIS TIME. I purchased this unit new as a gift for my parents and we discovered it is not compatible with Windows 10. Unfortunately they had already thrown the original box and packing away before I was able to check it out. Included are the 6 extra packs of photo paper and 3 ink cartridges that I purchased at the same time. There is one pack of photo paper and ink cartridge already installed and the other paper and ink packs are still unopened in their packages. The product has not yet been registered so the new buyer can submit the warranty card and register it.